Episode 10: Scorpion on Scorpion on Fox? 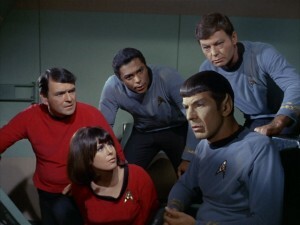 The Synthaholics continue the series on no longer neglecting some of the other Star Trek series. This time they tackle the Voyager episode Scorpion part 1 and 2. In this episode we give you a comprehensive if not through break down of the synopsis of this two parter episode. Listen as David voices harsh criticisms of Janeway that leave the other co-hosts scratching their heads! We also talk about the relationship between Janeway and Chakotay and which of them actually has cajones we also go into the hard decisions that had to be made to keep Voyager moving on the path to home! All this and more in this week’s episode of Synthaholics! The Synthaholics welcome Fayth Hertzberg to the the show as co-host and we do our first single episode review of a Deep Space 9 episode ! We decided to go with Badda Bing Badda Bang because it requires very little knowledge of Deep Space 9 or Star Trek in general to be able to enjoy this episode! This review isn’t a review in the mindset of giving it a rating we just talk about the episode and break it down the way we do here at Synthaholics! The fun way! How will the crew save Vic Fontane from Cheech and the Eyes? To find out grab a drink, have a sit down, and enjoy our take on Star Trek’s take of Ocean’s 11! Episode 8: RED ALERT Captain Pike to the Bridge! On this very special Episode of Synthaholics David drinks without his Co-Host, but he is not solo! Todd Shawn Tei joins David to talk about his Kickstarter project Star Trek: Captain Pike. We talk about the project, why Captain Pike, the tone of the show, and more! Please check out the Kickstarter link and support this amazing project! Let’s all do our part to keep Star Trek alive! Please follow this project on Twitter and Facebook. Links for everything related Star Trek: Captain Pike are provided below! Thank you Todd for joining us on this episode of Synthaholics! The Synthaholic’s crew has an interview with Karl Miller the Lead Singer and Bass Player of Warp 11. We talk about their upcoming album, what to expect when you start a themed band, the struggles of getting to play at Creation ran Star Trek Convention, Dungeons and Dragons and of course Star Trek! Find out Karl’s favorite series and other wise words! Please note this episode is rated explicit in iTunes and contains adult language and situations! You have been warned! Now that is out of the way pull up a chair and enjoy our first dual Synthaholic interview with Karl Miller! Episode 6: Robots Gone Wild!!!! Episode 6: Robots Gone Wild!!! Things get toasty as David and Aaron take a look all the times that robots in Star Trek have lost control and threatened humanity! In this episode you’ll hear about TOS Episodes What LIttle Girls are Made of? and The Changeling.We also briefly touch on Star Trek: The Motion Picture. We then move to TNG and talk about Datalore, The Schizoid Man, Brothers, and Descent 1 and 2! In this episode we are conveniently skipping talking about holodecks and holograms going wild. This may make subject matter for a future episode of Synthaholics! Plus an all new Riker Scores segment closing the book forever on our favorite android’s little black book! Don’t forget to check us out on iTunes so you can subscribe and leave us a rating and review so you can let us know how we are doing so we can improve! Live Long and Prosper! In this Episode David and Aaron discuss some casting news for Star Trek 3. We also talk about a big what if question and discuss a listeners idea for the future of Star Trek. We then move into our main topic of how we rate the different Star Trek Series. Once we each give our rating we then defend our reasoning. In an unexpected twist our rating is almost identical except for one key difference.Listen to find out! We talk The Original Series, The Next Generation, Deep Space Nine, Voyager and briefly the Animated Series! Check out this episodes cover art for a preview of this weeks Riker Scores! The Synthaholics David and Aaron do their first user requested episode theme! This theme being First Contact and more specifically the character of Zefram Cochrane. This character between the TOS Episode Metamorphosis and Star Trek: First Contact seem very different and so we dig into this subject to give you are deepest thoughts on this. In this episode we give our take on the synopsis for episode and movie. We also have our second Riker Scores and Harry Fails. All our music is provided by Warp 11. The Synthholics talk about the upcoming Star Trek movie news. We also discuss any news related to Star Trek on Television. We talk about the current state of Star Trek fan creations such as Star Trek Axanar, Star Trek Continues, and Star Trek Renegades. We also reveal all our hopes and dream for the future of Star Trek. Then we finally delve into what we think would really happen given what we know about the future of Star Trek Also. On this episode we introduce our new segment Riker Scores and Harry Kim Fails. All our music is now provided by Warp 11. Synthaholics David and Aaron use this episode to remember the great Leonard Nimoy. We open with a poem from Leonard Nimoy and we discuss some of our favorite Spock moments. We will also hear from other members of the Disruptor Beam team as well as Cosplayer Bellechere about their favorite Leonard Nimoy moments. Please check out Disruptor Beam and Bellechere links for them are below. I have also provided links for Nimoy’s poetry and photography. Synthaholics David and Aaron introduce themselves and discusses their top 5 favorite Star Trek Episodes. Listen as cheating ensues as they pick two parter episodes claiming them as one! As an added bonus we hear David speak with Disruptor Beam CEO Jon Radoff about the upcoming game Star Trek Timelines. Links for Disruptor Beam and Star Trek Timelines below! Please join our facebook group for Synthaholcis so we can start a great Star Trek community!